The Fluke 715 Volt mA Calibrator delivers outstanding performance, durability, and reliability in a compact, lightweight tool. 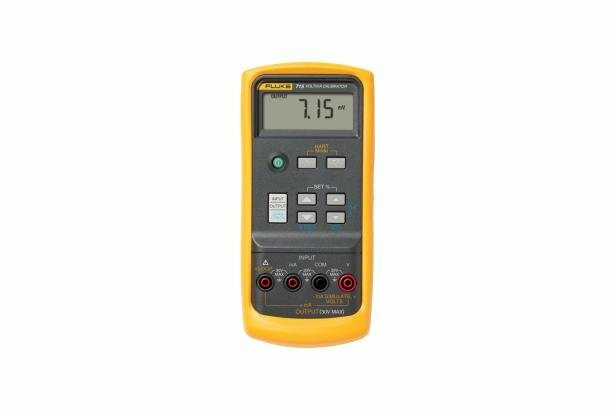 Offered in the rugged Fluke 80 Series DMM package, the calibrator measures loop current as well as voltage output. It sources voltage to 200 mV or 20 V, measures loop current (0-20 mA, 4-20 mA) signals with 0 .01 % accuracy and 1 µA resolution, and measures voltage output process signals from PLCs and transmitters. It can source or simulate 4-20 mA loop current and provides a 24 V loop supply with simultaneous current measurement. The 715 is also extremely easy to use with a simple push button interface similar to the multifunction Fluke 750 Series Documenting Process Calibrators. It features the rugged construction that Fluke tools are known for and is EMI tolerant and dust and splash resistant. It also features a removable battery door for quick battery changes.